The skin prick test is a routine test performed by allergists. It involves placing small amounts of allergens onto the skin then with a small lancet a superficial break in the skin is made. The test is monitered for 15 minutes and observed for any signs of a wheal or flare reaction. The skin prick test is low risk and delivers quick results for the doctor to gain an indication of each patient’s sensitivity. After an initial consultation, Dr Baker determines which allergens to test. The test will span over 40 allergens on your first appointment, with foods and inhalants extensively tested at no extra cost. Dr Baker’s preferred method of treatment is immunotherapy with a sublingual vaccine that is made on the premises and prescribed specifically for each patient. The treatment costs less than $1 a day and targets the allergens causing the patients sensitivity through a desensitising process. In order for the vaccine to be prescribed Dr Baker performs a second set of tests involving intradermal testing using very weak dilutions of the specific allergen in order in order to determine a safe and effective starting dose for each patient. The test involves injecting small amounts of diluted allergen extracts just under the skin. After waiting ten minutes, the skin is examined for a reaction. This procedure can be repeated using two to three dilutions of the same extracts, getting subsequently stronger or weaker each time. Once the patients skin reacts positively to a particular allergen(s), the test is complete and a vaccine can be made to desensitise against the allergens causing the patient problems. Dr Baker has an accreditted NATA laboratory on the premises where he performs the IgE tests. The levels of IgE immunoglobulin are often elevated in patients suffering from allergy. It is a quantative test that gives the doctor a clearer indication that the patient’s problem is allergy and not something else. The specific IgE sometimes referred to as RAST is a qualative test that measures the levels of IgE immunogloblin against specific allergens including both foods and inhalants. This test is performed in cases of contact dermatitis (Eczema) or any other allergy is suspected. The allergens are prepared in appropriate concentrations in white soft paraffin (e.g. Vaseline) and are then spread on to discs, 1 cm diameter. 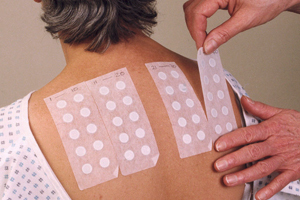 The discs (which are made of a special metal, cannot themselves provoke a reaction) are placed on the skin, usually on the back, and are kept in place by hypoallergenic tape. The skin is coded appropriately and the patient is asked to keep the skin dry. The patches are left in place for 48 hours. After 48 hours the discs are removed, the skin is examined and any redness or swellings are noted. The skin is re-examined after a further 48 hours for any remaining local redness or swelling. The interpretation of this form of testing is not as simple as it sounds and tends to be carried out by a doctor. The symptoms of contact dermatitis need to be brought under control before patch testing can be carried out, otherwise the results will be unreliable. Steroid creams need to be stopped for 3-4 weeks before testing as they may suppress the test response. Any professional interpreting skin, blood or patch tests must first interpret the results in the light of the patient's history. No test should be read in isolation. Despite continuing advances in the diagnosis of immunoglobulin E (IgE) mediated inhalant and food allergy utilizing in vitro technology, the otolaryngic allergist should be familiar with the principles and practise of skin endpoint titration (SET). 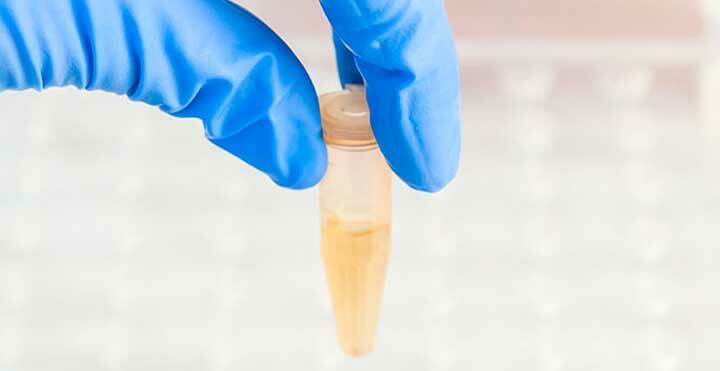 Skin testing techniques and responses will allow proper interpretation of in vitro-based antigen vial tests, will permit the blending of in vitro and in vivo test methods within the allergy practice, and will often give a clearer picture when a practitioner is caught in a confusing situation. Preparing to do a skin Endpoint Titration Test is time consuming and labour intensive requiring a trained scientific officer or doctor to perform the tests. A immunotherapy dosage for either injection or sub-lingual vaccine can be better determined using this method. A RAST test measures the level of allergen-specific IgE in your blood. That is, it measures the concentration of antibodies your body has created to against a particular food allergen. Interpreting a RAST result is slightly more complicated, however. This is because not everyone with the same concentration of allergen-specific IgE in their blood will react in the same way to the presence of an allergen in vivo (that is, in the flesh). Someone with a relatively low concentration of allergen-specific IgE may have a fairly severe reaction while someone with a higher concentration of allergen-specific IgE may not react at all -- that is, they're not truly allergic to a food even though the blood test comes out positive. (This is known as a false positive.) RAST tests have a high sensitivity and fairly low specificity, meaning that they have a low rate of false positives and a fair number of false negatives, though this varies by allergen. In general, lower rates of allergen-specific IgE are correlated with a lower chance of reacting in a double-blind food challenge or in a real-world setting, especially if skin test results are negative and if there's been no history of reaction to a given food. Different foods have different specific IgE levels that are considered "predictive." Where most people with a given level of specific IgE may react to one particular food, most people with that same level of specific IgE may not react to another food. Researchers determine these threshold levels by comparing RAST test results to the results of double-blind food challenges in order to find a level of specific IgE on the blood test where a very high percentage of people are truly allergic. This means that someone whose test results "look" identical for two different foods may be considered to have a positive result for one and a negative result for the other, if the foods have different threshold levels. Specific IgE tests are usually returned in units of micrograms per milliliter (μg/mL). Some, however, are returned on a numerical rating scale (often, but not always, from 0 to 5 or 6). On rated tests, 0 almost always indicates an exceedingly low chance of a true food allergy, while the higher numbers normally mean very strong probability of allergy and a strong likelihood of a severe reaction. Your allergist may use these results to help determine some aspects of your treatment -- to see whether a child is showing signs of outgrowing a food allergy, for instance. Dr Richard Stephen Baker is medical director of the practice and offers over 45 years of expertise. The company utilises highly sensitive diagnostic tests and operates a NATA Accredited immunology laboratory. In addition to allergy diagnosis we assist our patients to select the correct method of dealing with their allergic condition and provide allergy specific information. Following results of testing appropriate treatment is given either in form of oral or injection desensitisation therapy. Due to varying rates of metabolism 4 days is recommended as general advice to be off Antihistamines before testing. Please inform the doctor if you are taking any Antihistamines. Antidepressants can also effect testing. Please inform the doctor if you are taking any Antidepressants. Antimigraine products can also effect the testing. Please inform the doctor if you are taking any Antimigraine products.